Nicholas Hunziker's racing artwork is highly regarded as capturing the true essence of the best era in classic motorsports. 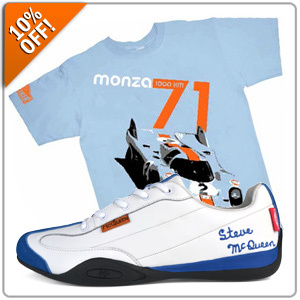 Officially licensed by Steve McQueen, Gulf Oil L.P. and McQueen Racing, these casual driving shoes by Hunziker are the ultimate in wearable art and provide motoring enthusiasts with another exciting way to express their passion. Be sure to enter promo code HUNZ10 during checkout where it says, "Have a Promo Code? Apply it now." Offer valid through June 21st!